Aristocratic Jacquard Silk Beige Embroidered Lehenga Style S..
Lehenga Saree is a new trend of Saree introduced in India. 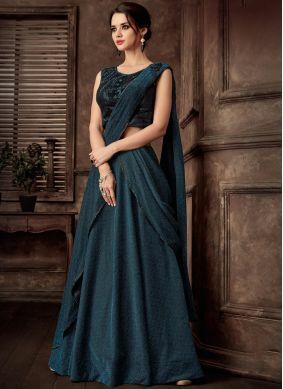 This is an aesthetic blend of the traditional Saree and a Lehenga Choli. Lehenga style saree is normally 4.5 meters to 5.5 meters long. Here unlike a sari one doesn't have to form pleats but simply 'tuck and drape'. 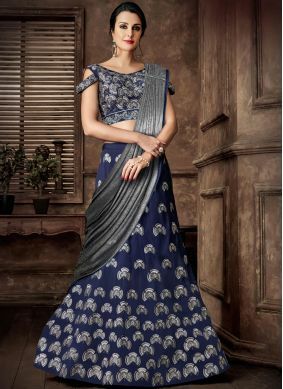 Like that of a traditional saree, the lehenga style saree is worn over a petticoat (in a skirt, pavadai in the south, and Shaya in eastern India), along with a designer blouse called as the choli, which is the upper garment. The style of choli mostly resembles as that of the choli of a conventional Lehenga or Ghagra Choli. Sometimes conventional blouses are also matched with lehenga style saree. The choli is mostly like that of halter neck style, deep neck or “backless” style. Like that of the saree, these cholis are also embellished with Kundan, beads, mirrors etc. Lehenga saree is a form of ready-made sarees that arose from the need for an artistic yet easy to wear party attire. The easy to wear option of the garment tells the ladies just to slip into it and be ready in minutes. Stitched as a long flared skirt with a zip at the side, it is made to the measurements of the wearer. The ensemble needs to be slipped in, fasten the zipper and drape the pallu over the shoulders. 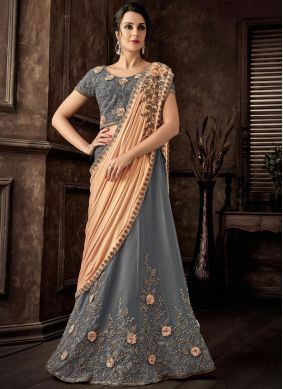 This is an outfit for ladies who are not comfortable with usual draping and pleating that the regular saree demands. This style of saree’s pallu has the dramatic effect of the matching dupatta of the conventional Lehenga Choli. Various rich and exquisite embellishments are used on Lehenga Style Sarees patterns which include Silver embroidery, Golden embroidery, Metal beads, Real pearls, wood beads, glass beads, mirror work, lacework, Kundan, sequins, glittering stones, zardozi etc. Mostly rich fabrics like silk, georgette, brasso, brocade, chiffon, crepe etc. are used in the making of a Lehenga saree.